﻿ Villa Guest House, Bangkok | FROM $10 - SAVE ON AGODA! "This guest house is in a lovely garden setting in a nice old..."
Have a question for Villa Guest House? "Hidden behind other buildings, and very quiet (which is rare in Bangkok)." 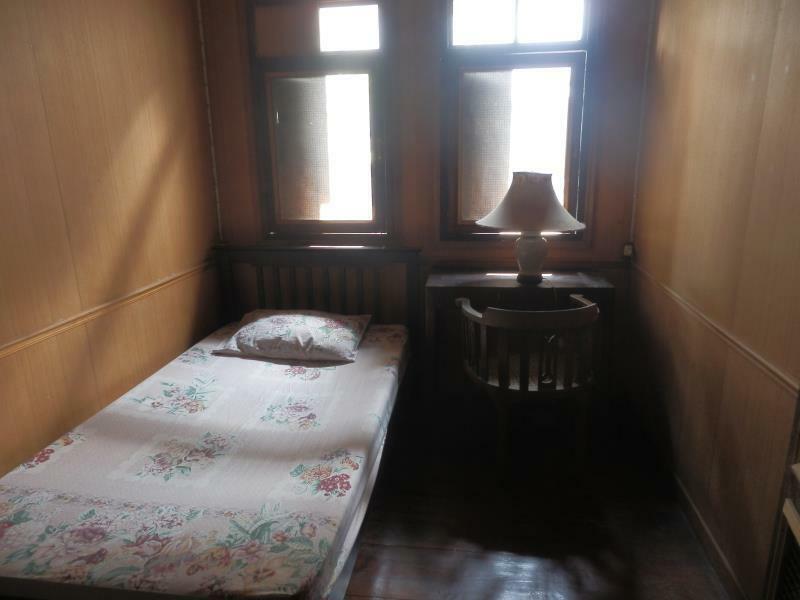 "This wooden guesthouse is a magical place." "Awesome atmosphere , like moving in the past time , we liked this vintage hotel !" "Great place, extremly helpful staff, thank you!" When visiting Bangkok, you'll feel right at home at Villa Guest House, which offers quality accommodation and great service. From here, guests can enjoy easy access to all that the lively city has to offer. Visitors to the hotel can take pleasure in touring the city's top attractions: Velothailand, Jack Armani Suit, Banglamphu. At Villa Guest House, the excellent service and superior facilities make for an unforgettable stay. The hotel provides Wi-Fi in public areas, library, smoking area, shared kitchen to ensure our guests the greatest comfort. The hotel features 12 beautifully appointed guest rooms, many of which include internet access – wireless, internet access – wireless (complimentary), non smoking rooms, desk, fan. Throughout the day you can enjoy the relaxing atmosphere of the garden. Villa Guest House is an ideal place of stay for travelers seeking charm, comfort and convenience in Bangkok. "I absolutely loved Villa Guest House and I will return if I..."
A simple, authentic place with a nice garden - a jewel in the center of Bangkok! Yes, it‘s a little dusty and the mattress is hard. But all in all this is just a magic place run by two dear old people I like coming back to. This wooden guesthouse is a magical place. It feels almost like time-traveling into Old Asia. I like the little garden and the proximity to Khaosan (10 min) walk. If you can put up with very simple, but clean living conditions this is the place for you. The only drawback: Being a wooden house, it can be quite noisy depending on the other guests. This is a lovely house located near the famous Koa San area. Everything about this house is vintage. The service is simple and friendly. A great place to experience a traditional Thai house in the heart of the city. Just don't stay here. We arrived after booking through agoda to be told we couldn't stay there. After finding out we were paying in cash, they miraculously allowed us to stay - such a shame. The place was probably a nice guesthouse at one time - it's an authentic Thai place owned by Thai's (although not sure about the sign at the front door saying 'No Thai's allowed') but my god this needs a clean.The bedroom was covered in dust and cobwebs which is all good and well if I wanted to stay in the jungle but not in Bangkok. The bathroom was worse, the mirror and ceiling were coated in cobwebs. Next the bed... Well, I'd probably have been more comfortable on a metal bench. It was unbelievably hard. And although it's hard to say with 100% certainty - were 99% sure my partner got bed bugs. I however didn't, which is the 1% - but bites were copious and not like mosquitos bites which I get regularly. It's cheap(ish) and close to town though. Owners were nice... after they agreed to let us stay. 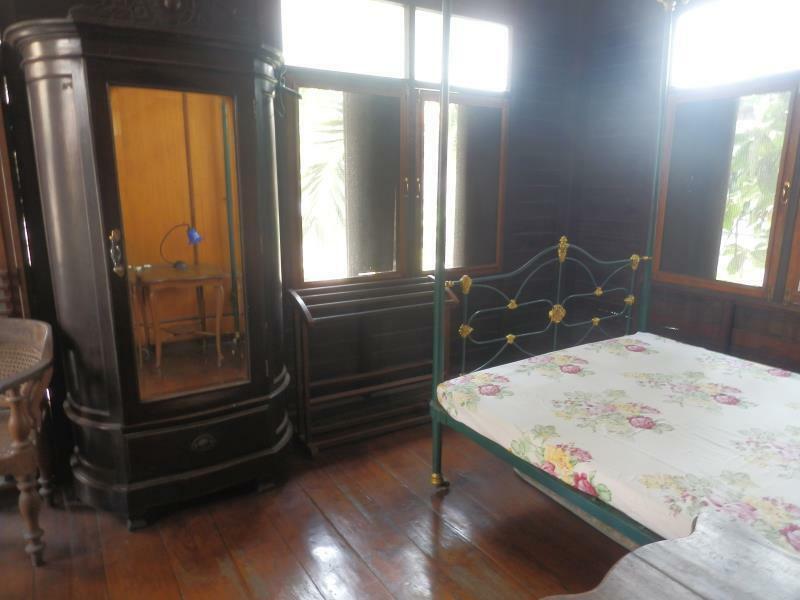 This guest house is in a lovely garden setting in a nice older wooden traditional Thai house. That's the good part. After that it goes downhill quickly. There was no mattress on the bed. Yes, you read that correctly. We were there for three nights, because they collected the money before we could see the room, and there was unbelievably no mattress on the bed. The place is also pretty dirty. I've traveled a lot in SE Asia and in India and this is on the lower end. There are a number of great guest houses in this part of town, so why bother with this? The house has a long history around 80-90 years old, some facilities are classic furniture, but is very clean. Free coffee and tea. The most important thing is the landlord and landlady are so kind, solve your problems and give your useful suggestions. I think the second floor with two separate beds maybe have a good scenery, I want to book one if I have chance back to Bangkok. Good location, I went to the the grand palace and the other temples just by walk. I'm in love in this house and hosts! Just near house is water machine- 1 bath for a bottle. And travel agency - they bring u to airport just for 150 bath! On the road is bus stop and buses goes everywhere(use Google maps, it helps to take a right bus). Across the road a few local cafe and 7 eleven. In the house u can use kitchen and refrigerate and also free coffee and tea(thanks to hosts again). It's two bathrooms in it, one with a hot water, if needed. Free wifi works well and everywhere. And wonderful garden! .So, if u wants to stay in real historical woden house, quit but close to party and to everywhere, Villa guesthouse is for you. I absolutely loved Villa Guest House and I will return if I ever come back to Bangkok. It is in walking distance to Khaosan rd and riverboats. Great location but without the noice from Khaosan. It's like a tiny oasis or secret garden in the middle of Bangkok's chaos. Good people, wonderful garden and the rooms are beautiful, it's living history. We did sneak in to a few empty rooms on day three to find a better matress and then upgrade to one of the deluxe rooms with a less hard bed and proper furniture. You haven't tried a hard bed until you've stayed at Villa Guest House. House with nice antike assessors. 7 min to walk to khao san road and verry qiuet with a nice garden. My bed was a verry hard and the matrass to big for the frame so at the ends the matrass arch. I am small, so I dont care, but the other beds lookd better. The bed is not comfortable. My partner is Turkish and they love a hard bed, but this was something else. But apart from that, this place is wonderful. The hosts are friendly and helpful, the location is perfect and the secret garden is such a joy from the concrete jungle of Bangkok. This is not a party place which is perfect to us as we wanted somewhere to chill. The clientele were just like us which Made it all the more lovely. 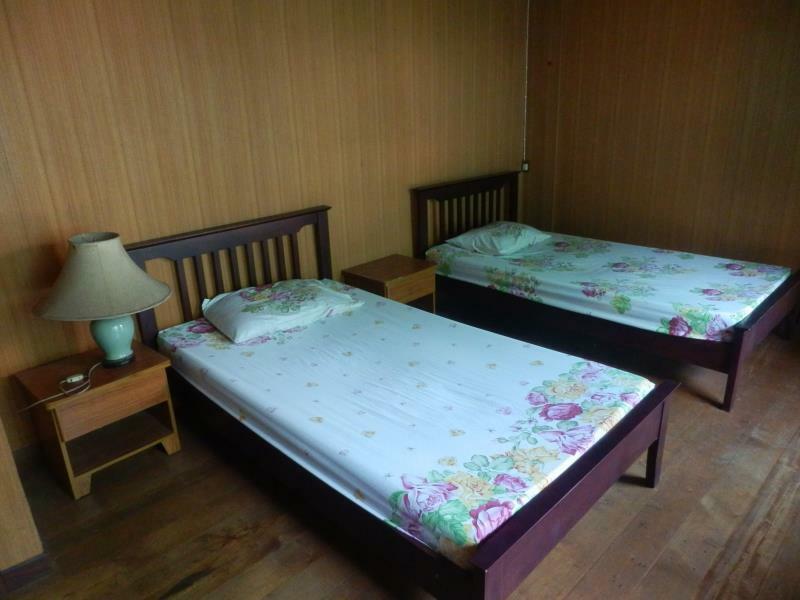 If you are over khao San road but want the location, want to be able to sleep at night listening to a peaceful garden in a quiet house, stay here!! Would definitely come back if we pass through Bangkok! The guesthouse is an old wooden Thai house with small tropical garden. Hidden behind other buildings, and very quiet (which is rare in Bangkok). Close to Khaosan. Our twin room was rather big, with huge windows overlooking the garden. The living room with the library and tons of vintage items was so charming! Bathroom was OK, with hot water and everything needed. The elder people that keep the house are calm and nice. They would store your luggage, and offer towels to take a shower even after checkout. The only drawback: beds are EXTREMELY hard (only mat, no mattress), which turned out to be a problem for me. Overall, a different stay in a unique old house, very good value for the money! this villa is quite old, made enitrely of wood and a peaceful garden for relaxation, managed by an old lady. The room is clean and has basic facilities. Washroom is seperate and generally clean. You have free access to tea and coffee, but make sure to wash your cups after use. The villa is located very close Khao San road and is walking distance from grand palace, reclining buddha and other major attractions. If you fancy a river cruise dinner, it also walking distance from this villa. If you are not very fussy about customer services, this villa is definitly recommended. I absolutely loved The Villa Guest House and wouldn't hesitate to stay there again in the future. Bordered by a small but evocative garden the teak structured building is a veritable treasure trove of antique furnishings & objets d'art collected over the decades by its wonderful owner and hostess. While it may not be embellished with all the accoutrements available in the plethora of generic "modern" hotels in Bangkok, the essence of the character of the Villa Guesthouse is quintessentially Thai, preserving the memory of the Bangkok of a bygone era. Would seriously recommend this place the lady that owns it is just adorable! She offers you tea and coffee all day. 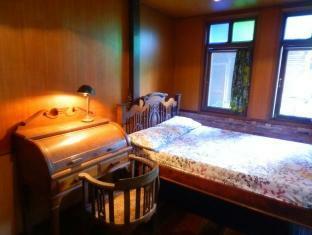 The guesthouse itself is almost like a museum, everything is vintage and antique which we personally loved! It was a little difficult to find at first, but the location is great as it is a short walk from khosan road but out of the way so there is no noise. We arrived very early after an overnight bus from koh tao and we were extremely tired, and the owner let us check in early so we could rest and shower. When we checked out at 11am, we asked if we could leave our bags there for the day as our train wasn't until the evening which she allpwed and even offered use of the showers later on that day even though we had already checked out. Highly recommended. This house, built over 100 years ago, made my Bangkok stay my most memorable experience while in Thailand. The large second floor room had floor to ceiling screened windows on three sides with the original teakwood shutters. The floors, again wide planked teak, gleamed with age and polish. The iron poster bed had thai-style mattress, firm and welcoming. The room also had a large desk and armoire along with several antique chairs. The owners, sister and brother, are the last in the family line that built the house and bring with them unparalleled knowledge of the neighborhood and surrounding area. Entered down a soi and small pathway this retreat is a far cry from the hubbub of Khaosan...I kept finding myself ensconced in my room not wanting go leave. Highly recommended. 1. Everything was more than 100 years old. Going inside the house like going inside a small museum. 2. The garden ouside is so lovely, full of green plants. 3. The owner, an old lady is very nice. I enjoy my time staying there a lot. Everything is so different. It is located nearby the Khaosan road (just 10 min walking) but it's peaceful and beautiful in its own way, living there you can feel like going back to the very old time. I would like to stay there again when i come back to Bangkok. Definitely a good experience for those who love peace ! The building is a low tech teak construction, so it does not get as hot as concrete. Although it does get a bit warm in summer. It's a bit like an ordered share house. The mature couple are present, but not in your face. What I like is that it is in contrast to the gentrification taking shape in the area. Not for everyone, but if you're after an experience in Thai charm than this the place. The beds are Asian style firm. All the rooms seem to have windows. The garden is a wonderful experience and well loved. It sets the mood of the place as the gate opens. 1) The beautiful garden. (2) The charming, century old house. (3) The delightful company of the guests and the owners. My jaw dropped when we stepped through the gate of the Villa. The lush, high-walled garden makes you forget that the bustling Khao Sahn neighborhood is just 100m outside the door. There are tons of retaurants and coffee shops within walking distance (including some great veg*n options: May Kaidee and Mango). We had a lovely time sitting in the garden and chatting the morning away with the interesting personalities that were also staying there. This is not a place for those who party hard. The owner is a friendly old woman who has very limited English, but she has posted signs requesting that guests do not participate in any sort of illegal behavior. Cigarettes and unmarried couples sharing beds are OK, raucous behavior is not. The amenities are Spartan, but they are fine for anyone used to traveling on the cheap. The owner will even let you store your bag for free after you check out, and she'll let you shower when you come to pick it up! All in all, I found our stay very rejuvinating. I highly recommend it! The best 3 things were the house is very nice with cool tranquil garden and classic style thai house I was made to feel very welcome there and the it has perfect location in bangkok area! I was very pleased I chose to stay and had a very enjoyable stay To meet with other interesting guest and nice relaxed atmosphere of the house Also very reasonable price Thankyou I hope to visit again!